President George W Bush has convincingly won the US election, the White House has said. But the final result hinges on the state of Ohio where, with 99% of votes counted, Mr Bush is leading Senator John Kerry by about 136,000. Mr Bush is delaying a formal victory claim to give Senator Kerry "time to reflect" on the results, chief of staff Andrew Card said. The president is expected to make a statement in the next few hours. The Democrats are so far refusing to concede, saying a substantial number of uncounted provisional ballots could yet give them victory in Ohio, which has 20 votes in the Electoral College. 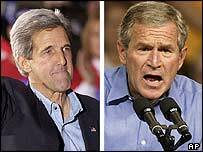 Current projections give Mr Bush 254 Electoral College votes and Senator Kerry 252. The winner needs at least 270. To win Ohio, John Kerry will have to rely on absentee and provisional ballots - votes that have been cast in cases where there is some doubt about the right of a person to actually vote. Ohio Secretary of State Kenneth Blackwell has released provisional vote numbers for 78 of Ohio's 88 counties, showing a total of 135,149 provisional ballots. Florida, Arkansas, Missouri, Indiana, Kentucky, Georgia, West Virginia, Alabama, Oklahoma, Tennessee, Virginia, South Carolina, North Carolina, Texas, Kansas, Nebraska, North Dakota, South Dakota, Mississippi, Louisiana, Wyoming, Utah, Arizona, Idaho, Montana, Alaska, Colorado and Nevada. Those ballots will not be counted until it is determined which were legitimate - a process that officials said could take at least 11 days. Correspondents say it is statistically possible for Mr Kerry to win Ohio and with it the presidency, but it is a long shot. Votes are too close to call in two other states, but neither will affect the final outcome. In Iowa, problems with vote-counting machines in two counties will delay results for at least one day. New Mexico is also undeclared for either candidate. Projections suggest the Republicans will strengthen their majorities in both houses of Congress. Early projections put turnout at more than 115 million voters -10 million more than in 2000. 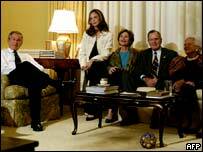 Chief of staff Andrew Card said he believed Mr Bush had won with "more votes than any candidate in history". "We are convinced that President Bush has won re-election with at least 286 electoral college votes. He also had a margin of 3.5m popular votes." The BBC's Nick Childs, in Washington, said the White House move was a clear attempt to put pressure on Senator Kerry to concede. Minnesota, Vermont, Delaware, Connecticut, the District of Columbia, Illinois, Maine, Maryland, Massachusetts, New Jersey, New York, Rhode Island, Pennsylvania, California, Washington, New Hampshire, Oregon, Michigan, Wisconsin and Hawaii. One third of seats in the Senate and the whole of the House of Representatives are also up for grabs. Republicans are projected to tighten their grip on the Senate, defeating Democratic leader Tom Daschle in South Dakota and capturing a string of seats across the South. Mr Daschle would be the first party leader to lose a race for re-election in more than 50 years. Two US television networks - NBC and Fox - have called Ohio for President Bush, but Mr Kerry's campaign has responded defiantly. Q&A What is going on? Mr Kerry's running mate John Edwards, told supporters in Boston: "John Kerry and I made a promise to the US people that in this election every vote would count and every vote would be counted. "Tonight we are keeping our word and we will fight for every vote." Mr Kerry is now at his home in Boston while Mr Bush is at the White House. The BBC's Rob Watson, at the Bush election HQ, says that, for the Republicans, it was a night that just seemed to get better by the minute. As the results started to come in, it was clear that the president had done much better than many pundits had predicted and some Republicans had feared. Speaking to reporters as early forecast results came in, Mr Bush said he was "very upbeat" and added: "I believe I will win." National security and the war in Iraq dominated the election campaign, with the economy largely taking second place. With American foreign policy taking a central role in the election, the outcome is being watched keenly all over the world.